Two early classic shockers from David Cronenberg, the Canadian director whose cerebral horror films have brought a degree of respectability to a genre that is usually more than happy to merely cater to our baser instincts, receive a welcome release on two Region 2 discs from Metrodome. Both discs contain ten-minute video introductions by Cronenberg (originally shot for FilmFour), extensive production notes by Kim Newman, theatrical trailers for both films and photo’ galleries. Neither transfer looks particularly appealing, but this seems to be due more to the deficiencies of the original film materials rather than any shortfall with these particular transfers. There is some occasional digital artefacting in evidence, but it’s not too distracting. The 1.78:1 (anamorphic) widescreen compositions seem better framed than the full-screen versions, (both crop picture information at the top and bottom of the frame, and add it at the sides). The discs are generally significant improved over previous home video presentations, and markedly better than a couple of earlier UK discs, Scanners and The Brood. Audio on both discs is Dolby Digital mono 2.0 at 224kbps, and is perfectly adequate. 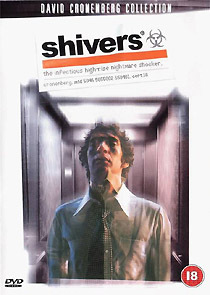 The new version of the 1975 film Shivers is missing the opening Target International logo’ from earlier VHS versions, but this alone does not explain the difference in running time between the longest BBFC certificated version (84’17”) and the new one (83’26”). This version of the 1977 film Rabid runs considerably faster than the UK Video Gems VHS version, suggesting that the Video Gems version was a standards conversion from an NTSC master. This probably explains the discrepancy in the various running times listed at the BBFC (the longest previous version is listed at 90’59”, the new one is 86’48”). The disc is also missing the same footage as the version screened by the BBC (a twenty-second sequence excised because of print damage, at the end of the news report at 01:02:07), suggesting that this may have been the source of Metrodome’s master.